This week down Brit Grit Alley I interview Brit Grit superstar Howard Linskey. PDB: Congratulations on the deal with Penguin. How did that come about? HL: Thanks. I’d been working on a new book with some different characters and my agent, Phil Patterson at Marjacq, sent it out to publishers. One of the first to read it was Emad Akhtar at Penguin Random House and, luckily for me, he really liked it. They completed the deal during the London Book Fair, which was very exciting, as Phil kept calling me from the stand there to update me and I could hear the buzz of the fair in the background. It took a little while to sink in though. Like every author, I’d dreamed of a big publisher buying my books one day. I am obviously absolutely thrilled to be moving to Penguin. They are the most iconic name in publishing so I feel really honoured to be working with them. PDB: How do you think it will be different working with Penguin than with No Exit Press who published your previous books? HL: No Exit are a great publisher with a very cool list but obviously they are not as big as Penguin, so there should hopefully be more resources available for promotion and marketing, which is vital when it comes to raising awareness of a book or author. I think all authors are battling to get their books noticed and I’m no exception. Having a story launched by Penguin will hopefully give me a bit of a head start in that respect. I’ve been really impressed by my editor’s enthusiasm to make the story as strong as it can be then get the book noticed by as many people as possible. PDB: You’ve published three very well received crime novels so far; The Drop, The Damage and The Dead. Could you tell us something about them? HL: David Blake is a white collar, somewhat reluctant criminal who starts out believing he can enjoy the trappings of the criminal world without any of the downsides; like violence, imprisonment or death. The wheels come off his life one day however when a large sum of money he is responsible for goes missing and he is given 72 hours to get it back or he’ll be killed. That’s how ‘The Drop’ begins. Blake is the anti-hero of three books that are all set in the Newcastle and, in each one, he is drawn deeper and deeper into the criminal underworld. 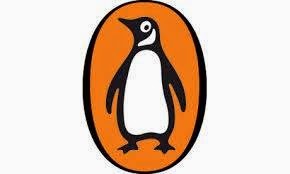 PDB: How will the books you’ll have published by Penguin differ from your previous books? HL: Once I’d finished the David Blake trilogy I really wanted to write something different. I was reluctant to churn out twenty very similar novels all featuring the same character. I’d been sitting on what I thought was an intriguing idea for a long while but this one was more of a mystery. It’s set in a village in County Durham in the north east of England and involves a journalist in disgrace who returns home to investigate the mysterious disappearance of a fifteen year old girl. Then a body is found in the village but it’s not the girl. Instead it’s a sixty year old corpse and nobody knows who the victim is or why he was murdered. The journalist, Tom Carney, teams up with local reporter, Helen Norton, and out of favour Detective Constable, Ian Bradshaw, to try and uncover the truth in both cases. PDB: There was talk that The Drop being made into a television series. What’s happening there? HL: Hopefully it will happen but it is a very slow process. The film rights to the David Blake books have been optioned by Harry Potter producer, David Barron, and are being adapted by ‘Layer Cake’ writer, J.J Connolly, so they couldn’t be in better hands. Watch this space. PDB: You have a short story included in the next Mammoth Book Of Best British Crime, edited by the legendary Maxim Jakubowski. How does that connect with the characters in your novels? HL: I was really honoured to be included in the ‘Mammoth Book of Best British Crime’ by Maxim. The short story features some of the supporting characters from the David Blake books but it’s set twenty years earlier than ‘The Drop’. David Blake is not in this one but the firm’s enforcers and its leader, Bobby Mahoney, the man who runs Newcastle’s criminal world, all feature. A gang of young lads tries to rip off Bobby only to belatedly realise they are well out of their league. Mahoney lines them all up on the edge of an abandoned high rise to make them talk. Hopefully it is an enjoyable read if you like crime fiction but maybe not so much if you suffer from vertigo. PDB: Do you plan to publish more short stories? Is it very different to writing a novel? HL: I know that most authors write short stories but I’m the exception as I had honestly never written one before. As you know, I agreed to write it for the charity anthology, ‘True Brit Grit’, masterminded by Luca Veste and yourself then I got slightly panicky, as I didn’t know if I could even write a short story. It was very different to tackling a full length novel and I was pleased with the result in the end but I don’t know if I’ll write any more. They do take up quite a bit of time and I was really struggling to finish ‘The Damage’ around then. I edit my books a lot along the way, so I am always short of time. I also look after my young daughter outside of school hours, so I only have a limited window each day for writing. PDB: How does your training and work as a journalist help with your writing? HL: I think it makes me a better and more ruthless self-editor and I am very deadline focused. As a journalist you could write the best story in the world but it will be useless if you miss the deadline and it doesn’t even make it into the paper. That old Douglas Adams’ quote, “I love deadlines. I like the whooshing sound they make as they fly by,” is very funny but I could never be like that. I’ve never missed one. I’m always very aware that someone is sitting there waiting for me to submit work so they can get on with their job and I hate to mess people about. Working as a journalist also helped me a lot with my new book as I was writing about a journalist in an era that I worked in, so I knew how it was to be a reporter in a pre-internet age, where mobile phones were either non-existent or rudimentary and newspapers still wielded enormous power as one of the main providers of news, along with TV and radio. HL: I’ll be working on the second draft of my new book prior to publication by Penguin in 2015. Then I’ll be turning some of the ideas I’ve got, involving the three main characters, into books two and three. In short, the hard work starts here. 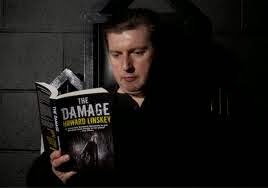 Bio: Howard Linskey’s first novel, The Drop, was voted one of the Top Five Thrillers of 2011 by The Times Newspaper. His second, The Damage, was a Top 12 Best Summer Read in the same newspaper. Both books reached the top five in the Amazon Kindle charts and the David Blake trilogy has been optioned for film by Harry Potter producer, David Barron. Originally from the north east, Howard lives in Welwyn, Herts, with his wife Alison and daughter Erin.